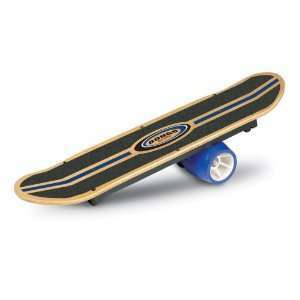 The Bongo Board is an advanced type of balance training device. The board stands on a cylindrical roller so it offers another degree of instability. This system takes a variety of exercises to an entirely new level – rolling, push-ups etc. It`s often used by skiers, snowboarders, skaters, surfers, golfers, basketball and football players and others for effective training. Bongo Boards are designed mainly for advanced users but even beginners will experience a lot of fun. Fitterfirst Bongo Board is the number one on the market now – the roller is separated into two parts that rotate independently which enables even more freedom of rolling. The plate has a classical skateboard shape which is very comfortable. And a removable safety cord is added too (see the video). If you already have some experience with balance training or want to start with the best tool right away, I would definitely recommend it to you. If you don`t want to spend too much money, there is a cheaper version of Bongo Board – the Carrom. The shape is flat (no skateboard design), wheels do not rotate separately and no safety chord is present – these are the main disadvantages. I would rather recommend you the Fitterfirst – but if you are short on funds, this one will do it`s job as well.